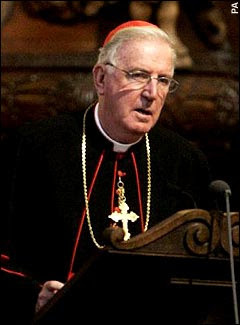 Cardinal Cormac Murphy-O'Connor has given his backing to calls for a change in the law, in what is being seen as a "more pragmatic" approach to the abortion issue. Leading Catholic commentators said last night that it marked a significant development for the cardinal and the Catholic Church in this country, considering that abortion is regarded as "evil" and a mortal sin by the Vatican. He argues for the first time that the Government should change the current law, which allows terminations to be carried out as late as 24 weeks into a pregnancy, even though premature babies have recently survived after being born at 22 weeks. "While upholding the principle of the sacredness of human life, I believe it is both licit and important for those in public life who oppose abortion to work and vote for achievable and incremental improvement to an unjust law," the cardinal says. "That is why I would support in any way I can MPs who take this stance and are pushing for a reduction in the upper time limit." Cardinal Murphy-O'Connor has entered the abortion row following the launch of a parliamentary inquiry into the suitable upper time limits for abortion, which is expected to publish its report this week. The Catholic bishops in England and Wales restated their official condemnation of abortion as recently as 2004, describing it as "the taking of an innocent human life", and Pope John Paul II said that it "constitutes a grave moral disorder". Earlier this year the cardinal said that Catholic politicians who supported terminations should not receive Holy Communion, adding that they should approach the Eucharist "only after receiving faithfully the sacrament of penance". However, while remaining opposed to abortion, he is understood to be keen to build an alliance to fight the current law. "In the past Catholic teaching has been seized upon by people on both sides to polarise the debate," the aide said. "The cardinal is taking a new approach to reach out to the majority in the middle who want abortion to become rarer, but this is not an embracing of relativism." Cardinal Murphy-O'Connor also attacked advice given by the Royal College of Obstetricians and Gynaecologists that argued women should no longer have to obtain the signatures of two doctors to have an early abortion. "To relax oversight and accountability puts us on the road to unlimited access to abortion," he said. Yesterday he presided over a service at Westminster Cathedral held to mark the 40th anniversary of the Abortion Act, since which 6.7 million terminations have taken place. Thousands of pro-life activists attended the service, which followed a rally outside the Houses of Parliament. Helen Watt, the director of the Linacre Centre for Healthcare Ethics, backed the move to change the law in a pro-life direction. "I share the cardinal's wish to save at least some human lives from destruction," she said. Fr Ian Ker, a lecturer in theology at Oxford, said that the cardinal's stance seemed to represent "a more pragmatic" approach to the issue. "Some critics might say that this looks like compromise," he said. "The Holy See might consider that 'unjust' is a very weak word to use to describe a law that permits the killing of unborn children." 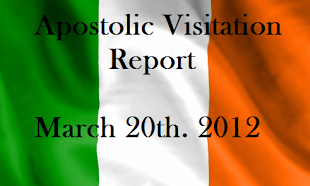 However, John Smeaton, the national director of the Society for the Protection of Unborn Children, expressed concern. "He is not making the right approach," he said. "Abortion should be made unlawful, but any attempts to reform the upper limit could backfire by making the law even worse." Meanwhile, the parliamentary committee conducting an inquiry into abortion is set to split over the contents of its report. Two members of the science and technology committee are threatening to publish a "minority report" if the group's findings do not give sufficient weight to claims that premature babies can survive at an ever younger age. MPs are due to meet today, when members would be assured that all their views, and the scientific evidence supporting the arguments, would be reflected in the report.